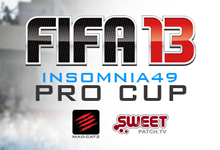 During insomnia49 this weekend we will be bringing you 5 FIFA 13 tournaments over the Friday, Saturday and Sunday. On Friday we will have the World Cyber Games FIFA 13 UK Championship (PC) and Casual 1v1 Xbox 360 Tournament, on Saturday we have the FIFA 13 Pro Cup sponsored by Mad Catz and the always popular 2v2 Casual Cup in the evening and on the Sunday the FIFA 13 Pro Cup completes and we have the pinnacle of the FIFA 13 season, after the Final on the Sunday the Final League Table for the FIFA Masters Series (#FIFAMS) will be decided and then we will host the Grand Final of the first ever #FIFAMS. Get yourself signed up to the tournaments by clicking on the tournament names above and setting your RSVP.